Exceptional Denver Entertainment . . .
With more than two decades of experience in the music industry, Zanichelli Entertainment is a music booking agency specializing in Jazz, Latin, Blues, Classical and World Music. Our services also include the management and technical skills to bring the artists together with the client and audience both locally and nationally. As a producer and musician, Charlie Zanichelli understands all facets of the entertainment business. That understanding will facilitate the best results allowing the Artist to focus on the most important part…the performance itself. The three artists that are featured to the right are just a few of the many great artists captioned on this site, and are among the many that we represent both locally and internationally. We will continue to represent only those artists who measure their performances by standards of excellence. 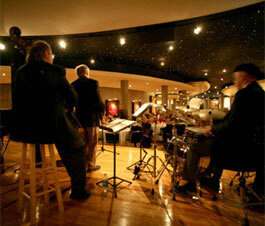 The DJQ performs at a variety of venues from small to large, from club dates to jazz festivals. Tenor saxophonist Eric Alexander finds himself at the top of today's great tenor players, playing with all the greats. Our Clients include some of the most notable corporations both locally and nationally. Among the many clients we have provided live music for include Microsoft, Nike, Wells Fargo, Lockeed-Martin, Motorola, Bacardi, Mannatech, Shamrock Foods and Frontier Airlines. We take pride that our clients keep coming back to us for our professional guidance and high standards of excellence. Our clients have had the pleasure of being entertained at some of the most prestigious venues such as the Brown Palace in Denver, the Broadmoor in Colorado Springs, the Hyatt in Beaver Creek, the Denver Center for the Performing Arts and many of the major hotels in our mountain resort communities.